The amount of 175 USD has been withdrawn from your account. Accounts: U2631114->U18892722. Memo: Shopping Cart Payment. Deposit amount $ 175.00, for MYINVESTBLOGER. Date operation 2019-02-16 08-55-25.. Date: 08:38 16.02.19. Batch: 246717834. The amount of 14 USD has been deposited to your account. Accounts: U18892722->U2631114. Memo: API Payment. 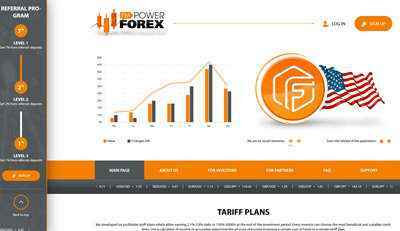 Withdraw 14.00000000$ to MYINVESTBLOGER. From EmpowerForex. Date 2019-02-17 05:44:32.. Date: 05:26 17.02.19. Batch: 246808957. The amount of 3.68 USD has been deposited to your account. Accounts: U18892722->U2631114. Memo: API Payment. Withdraw 3.68000000$ to MYINVESTBLOGER. 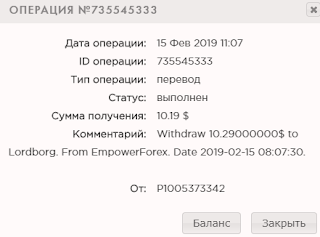 From EmpowerForex. Date 2019-02-17 16:29:34.. Date: 16:11 17.02.19. Batch: 246872704. The amount of 6.79 USD has been deposited to your account. Accounts: U18892722->U2631114. Memo: API Payment. Withdraw 6.79000000$ to MYINVESTBLOGER. 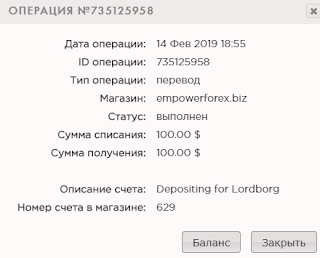 From EmpowerForex. Date 2019-02-17 18:12:13.. Date: 17:54 17.02.19. Batch: 246883397. The amount of 3.68 USD has been deposited to your account. Accounts: U18892722->U2631114. Memo: API Payment. Withdraw 3.68000000$ to MYINVESTBLOGER. From EmpowerForex. Date 2019-02-19 10:01:10.. Date: 09:43 19.02.19. Batch: 247088739. The amount of 0.7 USD has been deposited to your account. Accounts: U18892722->U2631114. Memo: API Payment. Withdraw 0.70000000$ to MYINVESTBLOGER. From EmpowerForex. Date 2019-02-19 19:48:45.. Date: 19:30 19.02.19. Batch: 247164479. The amount of 3.67 USD has been deposited to your account. Accounts: U18892722->U2631114. Memo: API Payment. Withdraw 3.67000000$ to MYINVESTBLOGER. From EmpowerForex. Date 2019-02-20 10:07:32.. Date: 09:49 20.02.19. Batch: 247231394. The amount of 3.68 USD has been deposited to your account. Accounts: U18892722->U2631114. Memo: API Payment. Withdraw 3.68000000$ to MYINVESTBLOGER. From EmpowerForex. Date 2019-02-21 09:29:45.. Date: 09:11 21.02.19. Batch: 247368882. The amount of 3.67 USD has been deposited to your account. Accounts: U18892722->U2631114. Memo: API Payment. Withdraw 3.67000000$ to MYINVESTBLOGER. From EmpowerForex. Date 2019-02-22 11:05:38.. Date: 10:47 22.02.19. Batch: 247519734. The amount of 3.68 USD has been deposited to your account. Accounts: U18892722->U2631114. Memo: API Payment. Withdraw 3.68000000$ to MYINVESTBLOGER. From EmpowerForex. Date 2019-02-23 10:10:58.. Date: 09:52 23.02.19. Batch: 247641599. The amount of 3.67 USD has been deposited to your account. Accounts: U18892722->U2631114. Memo: API Payment. Withdraw 3.67000000$ to MYINVESTBLOGER. 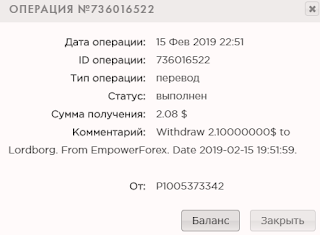 From EmpowerForex. Date 2019-02-24 08:59:41.. Date: 08:41 24.02.19. Batch: 247750937. The amount of 3.68 USD has been deposited to your account. Accounts: U18892722->U2631114. Memo: API Payment. Withdraw 3.68000000$ to MYINVESTBLOGER. From EmpowerForex. Date 2019-02-25 10:05:14.. Date: 09:47 25.02.19. Batch: 247885605.